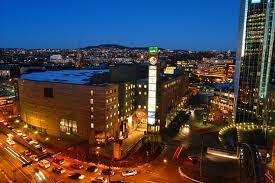 Our budget flats and rooms are located just a short walk from the Oslo Spektrum concert hall. Oslo Spectrum is primarily known for hosting big events such as the Nobel Peace Prize Concert, Eurovision Song Contest, and concerts by world famous artists. Room for rent - cheapest room in the Oslo city centre? One of Oslo Spektrum's prime attributes is its location in the middle of downtown Oslo, next to the Central Station, long and medium haul bus terminal, Jernbanetorget public transportation hub and only a short distance from international ferry terminalsational and international fame.